A simple program for recording audio files (supported audio formats: WAV and MP3) as well as playback of audio files. The program is freeware. 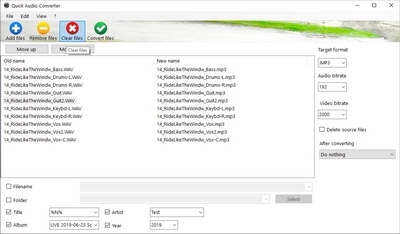 The program also contains an additional audio converter tool which allows the converting of audio files (some video file formats, too) into other audio formats (E.g. from WAV to MP3 or MP4 to WAV). - WAV, MP3, OGG, AAC, AIF, ASF, AST, AU, FLAC, FLV, M4A, MP2, MP4, MPG, RA, SF, VOC and WMA.